Grammar Guidelines for your Class! There is no question that text-speak has crept into classrooms; however, the question to date was whether or not adolescents were able to switch between writing text messages and using correct English grammar for class work. The results of this study indicate that most adolescents are not able to do so. The fundamental question is, will kids be able to limit their texting language to just text messaging? 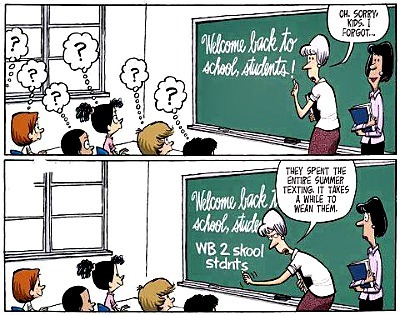 Or, will the frequent use of texting bleed into kids’ use of language in more formal settings? If the latter is true, then we’ve got a problem on our hands. The study found that adolescents’ frequent use of word adaptions in text messages correlated to lower grammar scores. But frequent structural adaptations (capitalization and punctuation) did not negatively impact test scores. The research showed that the more kids’ used word adaptations in texting, the lower they scored on the grammar test; but this does not prove that their texting habits caused their poor test performance. 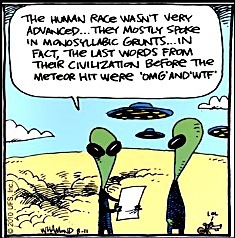 It may be the other way around: that kids who are less skilled with grammar use more word adaptations in their texts. 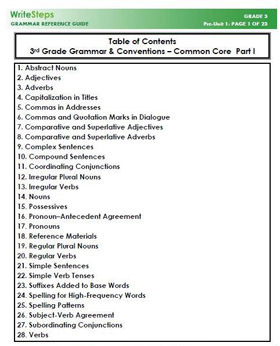 Our free grammar guides include all of the recommended grammar and conventions listed in the writing Common Core Standards. 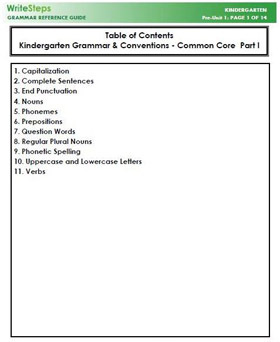 The grammar guides are available for kindergarten through 5th grade. Read on to find the link for the grammar guides below. These comprehensive guides are a tool you can use that will provide your students with the knowledge needed to demonstrate command of the conventions of Standard English grammar during writing. Below is a shortened example of the material available in the 4th grade grammar guide. All of the grammar guides follow the same format but contain content specific to each grade level. Core Standard: L.4.1: Students will use modal auxiliaries (e.g., can, may, must) to convey various conditions. Model auxiliaries are helping verbs that are used to add meaning and convey time (past, present, future). The modal auxiliaries are am, is, was, are, were, has, have, had, could, should, would, will, shall, be, been, being, can, may, must, might, do, did, does, ought, used to, need. In the following examples, modal auxiliaries are underlines and verbs are in gray. WriteSteps is a proud supporter of the 2013 Annual Bammy Awards! Presented by the Academy of Education Arts and Sciences International, the Bammy Awards is a cross-discipline honor that identifies and acknowledges the extraordinary work being done across the entire education field every day– from teachers, principals and superintendents, to school nurses, support staff, advocates, researchers, school custodians, early childhood specialists, education journalists and parents. Nominations are accepted online at www.bammyawards.org. 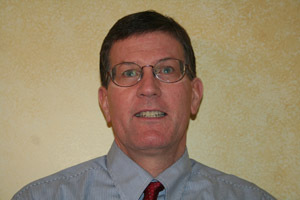 WriteSteps Welcomes New Team Member Steve Higgins! When Steve is not busy raising awareness of WriteSteps in Maine and New Hampshire, he enjoys playing soccer, hiking, skiing, biking, and other outdoor activities. WriteSteps will exhibit at the New Hampshire Association for Supervision & Curriculum Conference in Concord, NH. Steve Higgins, Awareness Ambassador, will be there from 8:30 a.m. to 3:30 p.m. to answer your Common Core writing questions! While there, you can sign up for a free trial to eWriteSteps, which automatically enters you into a drawing to win a new iPad!